The docroot/WEB-INF/service/com/nosester/portlet/eventlisting/ package contains utility classes and interfaces for the Event Listing project. All the classes and interfaces in the service folder are packaged in a .jar file called event-listing-project-portlet-service.jar, in your docroot/WEB-INF/lib folder. This .jar file is generated whenever you run Service Builder. It’s possible to place this .jar file on your application server’s global classpath to make your project’s services available to other projects. This allows a portlet in different project, for example, to create, update, and delete Events and Locations. Of course, you should consider the security implications of placing your project’s service .jar file on your application server’s global classpath: do you really want to allow other plugins to access your project’s services? The docroot/WEB-INF/src/com/nosester/portlet/eventlisting package contains the implementation of the interfaces defined in the docroot/WEB-INF/service/com/nosester/portlet/eventlisting package. It belongs to the Event Listing project’s classpath but is not available outside the Event Listing project. Service Builder generates classes and interfaces belonging to the persistence layer, service layer, and model layer in the docroot/WEB-INF/service/com/nosester/portlet/eventlisting and docroot/WEB-INF/src/com/nosester/portlet/eventlisting packages. Let?? ?s look at the classes and interfaces generated for Events. The ones generated for Locations are similar. You won’t have to customize more than three of these classes for each entity: -LocalServiceImpl, -ServiceImpl, and -ModelImpl. EventPersistence: Event persistence interface that defines CRUD methods for the Event entity such as create, remove, countAll, find, findAll, etc. EventPersistenceImpl: Event persistence implementation class that implements EventPersistence. EventUtil: Event persistence utility class that wraps EventPersistenceImpl and provides direct access to the database for CRUD operations. This utility should only be used by the service layer; in your portlet classes, use EventLocalServiceUtil or EventServiceUtil instead. Figure 4.6: Service Builder generates these persistence classes and interfaces. You shouldn’t (and won’t need to) customize any of these classes or interfaces. EventLocalService: Event local service interface. 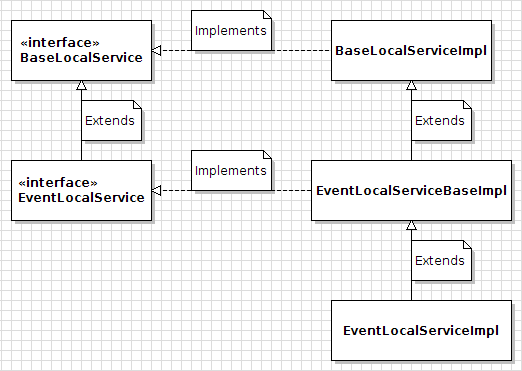 EventLocalServiceImpl (LOCAL SERVICE IMPLEMENTATION): Event local service implementation. This is the only class in the local service that you should modify manually. You can add custom business logic here. For any custom methods added here, Service Builder adds corresponding methods to the EventLocalService interface the next time you run it. EventLocalServiceUtil: Event local service utility class which wraps EventLocalServiceImpl and serves as the primary local access point to the service layer. EventLocalServiceWrapper: Event local service wrapper which implements EventLocalService. This class is designed to be extended and it allows developers to customize the local Event services. Customizing services should be done via a hook plugin. Figure 4.7: Service Builder generates these service classes and interfaces. Only EventLocalServiceImpl allows custom methods to be added to the service layer. EventService: Event remote service interface. EventServiceImpl (REMOTE SERVICE IMPLEMENTATION): Event remote service implementation. This is the only class in the remote service that you should modify manually. Here, you can write code that adds additional security checks and invokes the local services. For any custom methods added here, Service Builder adds corresponding methods to the EventService interface the next time you run it. EventServiceUtil: Event remote service utility class which wraps EventServiceImpl and serves as the primary remote access point to the service layer. 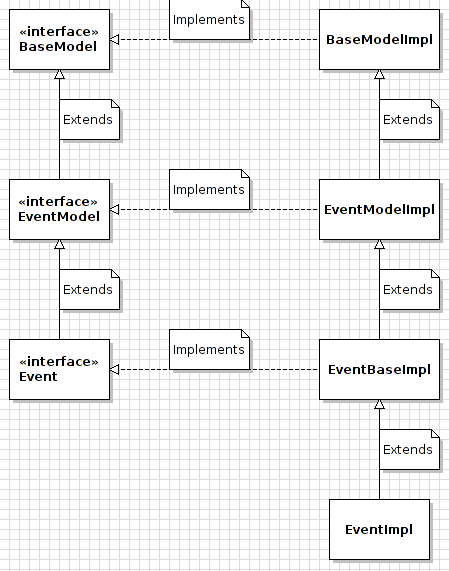 EventSoap: Event SOAP model, similar to EventModelImpl. EventSoap is serializable; it does not implement Event. EventModel: Event base model interface. This interface and its EventModelImpl implementation serve only as a container for the default property accessors generated by Service Builder. Any helper methods and all application logic should be added to EventImpl. EventModelImpl: Event base model implementation. Event: Event model interface which extends EventModel. EventImpl: (MODEL IMPLEMENTATION)Event model implementation. You can use this class to add helper methods and application logic to your model. If you don’t add any helper methods or application logic, only the auto-generated field getters and setters are available. Whenever you add custom methods to this class, Service Builder adds corresponding methods to the Event interface the next time you run it. EventWrapper: Event wrapper, wraps Event. Figure 4.8: Service Builder generates these model classes and interfaces. Only EventImpl allows custom methods to be added to the service layer. Each file that Service Builder generates is assembled from an associated Freemarker template. You can find Service Builder’s Freemarker templates in the com.liferay.portal.tools.servicebuilder.dependencies package of Liferay’s portal-impl/src folder. For example, if you want to find out how a -ServiceImpl.java file is generated, just look at the service_impl.ftl template. Of all the classes generated by Service Builder, only three should be manually modified: EventLocalServiceImpl, EventServiceImpl and EventImpl. If you manually modify the other classes, your changes will be overwritten the next time you run Service Builder. Next, let’s learn how to call core Liferay services. Calling core Liferay services in your portlet is just as easy as calling your project’s services that you generated via Service Builder.